ALHAMBRA >> A crash between a motorcycle and bicycle left the bicyclist hospitalized in critical condition on Saturday afternoon, police said. The collision took place about 1:15 p.m. at the entrance to Granada Park, along Hellman Avenue, between Palm and Raymond avenues, Alhambra police Sgt. Ruben Soriano said. Paramedics took the bicyclist, described as a man in his mid-20s, to an area trauma center with major injuries, the sergeant said. The motorcyclist, a man in his mid-40s, suffered apparently minor injuries and declined to be taken to a hospital. Police shut down the entrance to the park as they conducted an investigation Saturday afternoon. POMONA >> A 30-year-old man died late Saturday in a motorcycle crash on a transition road between the 60 and 71 freeways in Pomona, authorities said. Paramedics pronounced Christopher L. Smith of Los Angeles died at the scene of the solo-vehicle crash, which was reported about 10:50 p.m. on the transition road from the westbound 60 Freeway to the northbound 71 Freeway, California Highway Patrol Officer D. Crislip said in a written statement. Smith was riding a 2000 Kawasaki Ninja 500 at about 80 mph when he lost control, according to the CHP. Smith was wearing a helmet, officials added. The cause of the crash remained under investigation. Any witnesses or anyone with information was asked to contact the CHP’s Baldwin Park-area office at 626-338-1164. ALHAMBRA >> Authorities have identified a 31-year-old motorcyclist from Montebello who died in a crash after being cut off by pickup truck on an Alhambra expressway on Friday. Eric Kawai died at a hospital shortly after Friday’s 11:50 a.m. collision on the eastbound 10 Freeway, just east of Garfield Avenue, according to Los Angeles County Department of Medical Examiner-Coroner records. He was initially described by California Highway Patrol officials as 32 years old. Prior to the crash, Kawai was riding a 2015 Kawasaki Ninja motorcycle in the right-hand lane of the two-lane express way, which runs along the left-hand side of the eastbound 10 Freeway, Officer J. McKee of the CHP’s East Los Angeles Office said in a written statement. A 1986 Toyota pickup truck being driven by a 19-year-old El Segundo man was heading east on the 10 Freeway in the fast lane, “in heavy stop-and-go traffic,” McKee said. Kawai was overtaking the pickup truck when the driver veered across the solid double-white lines separating the freeway from the FasTrak expressway and directly into the motorcycles path of travel, McKee said. The motorcycle struck the pickup truck. The teenage driver of the pickup truck, as well as three other young men who were riding as passengers, suffered no injuries in the crash, officials said. Officers initially detained the teenage pickup truck driver, but he was not ultimately arrested, according to CHP officials. Anyone with information regarding the fatal collision is asked to contact the CHP’s East Los Angeles-area office at 323-980-4600. A fund established online at www.gofundme.com/eric-kawai to help Kawai’s family had raised more than $6,000 as of Wednesday. WEST COVINA >> A man died following a collision between his three-wheeled motorcycle and another vehicle in a West Covina intersection Sunday afternoon, officials said. The fatal crash took place about 1 p.m. at Azusa and Fairgrove avenues, West Covina police Lt. Ron Allen said. Paramedics took the injured motorcyclist to a hospital, where he succumbed to his injuries, police said. His identity was not released Sunday. Police shut down traffic on southbound Azusa Avenue at Autumn Drive and eastbound Fairgrove Avenue at Nelson Street as they carried out their investigation Sunday afternoon, according to the statement. The cause of the collision was yet to be determined. LA HABRA >> A La Habra man died late Friday following a crash between his motorcycle and a pickup truck on Harbor Boulevard in a La Habra, police said. Dominic Alvarez, 26, died at Orange County Global Medical Center in Santa Anta less than three hours after the crash, which took place at 9:02 p.m. on Harbor Boulevard, just south of Whittier Boulevard, according to Orange County coroner’s records. He was riding a motorcycle was involved in a collision with a pickup truck, La Habra police Sgt. Jeff Baylos said. Two women who were riding as passengers in the pickup truck were treated for apparently minor injuries, officials said. The driver of the pickup, described only as male, was unhurt. The cause and circumstances of the crash remained under investigation, officials said. Anyone with information was urged to contact the La Habra Police Department’s Traffic Unit at 562-383-4300. EL MONTE >> A man died after being thrown from his motorcycle into opposing traffic lanes on the 10 Freeway in El Monte Friday afternoon, authorities said. The crash was first reported about 3:15 p.m. on the westbound 10 Freeway near Santa Anita Avenue, Los Angeles County Fire Department officials said. The motorcyclist was ejected from the motorcycle, ultimately ending up in the eastbound traffic lanes, officials said. 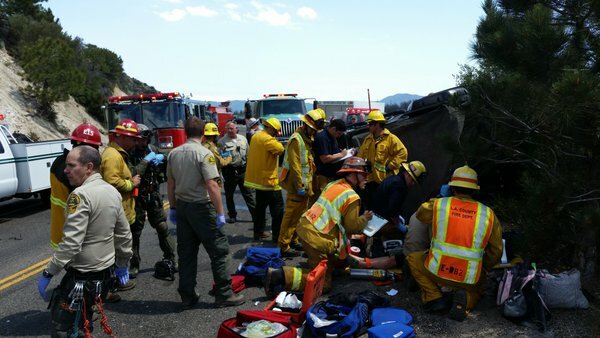 The collision involved as many as four vehicles, California Highway Patrol Officer Michelle Bond said. The motorcyclist was pronounced dead at the scene. No further details regarding the circumstances of the fatal collision were immeidately available. The CHP issued a Sig Alert for the FasTrak toll lanes in both directions of the 10 Freeway as officers investigated the crash. AZUSA >> An Azusa man died Saturday afternoon after a pickup truck rear-ended him on the 210 Freeway, triggering a chain-reaction crash, officials said. Enrique Alvarado-Cervantes, 26, died in the crash, which took place about 1 p.m. on the eastbound 210 Freeway, just west of Vernon Avenue, according to California Highway Patrol Officer Joshua Duran. He was riding a 2000 Suzuki GSX-R in the fast lane when traffic ahead came to a sudden stop, the officer said in a written statement. A 71-year-old Alta Loma man was driving directly behind the motorcycle in a 2000 Dodge Ram 2500 pickup truck. A 2000 Ford F-150 pickup truck was driving ahead of the motorcycle, lead by a 2011 Lexus IS 250. “(The pickup truck driver) was unable to stop his Dodge in time to avoid a collision,” Duran said. Paramedics pronounced Alvarado-Cervantes dead at the scene. The driver of the Dodge pickup that triggered the crash suffered injuries including a broken wrist, Duran said. The Ford driver suffered minor injuries, and the driver of the Lexus was unhurt. No arrests were made as the investigation continued, officials said. Authorities issued a Sig Alert for the carpool and three right-hand lanes of the eastbound 210 Freeway through nearly 5 p.m.
Any witnesses to the collision are encouraged to contact the CHP’s Baldwin Park area office at 626-338-1164. 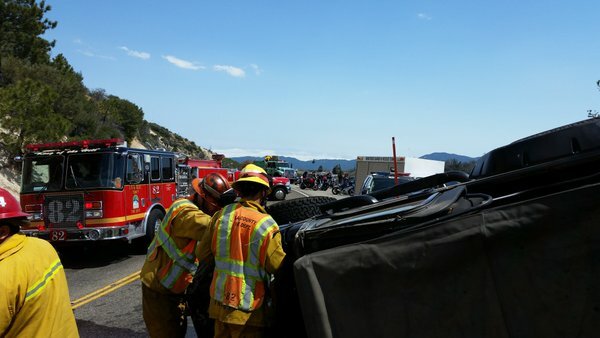 ANGELES NATIONAL FOREST >> A man died and two other people suffered serious injuries in a crash between a motorcycle and a car Sunday afternoon on Angeles Crest Highway, deep in the Angeles National Forest north of Altadena, authorities said. The collision was reported about 1:45 p.m. near mile marker 46.35 of the winding mountain road, on the forest road just south of Mount Mooney Road, California Highway Patrol Officer Alex Rubio said. A man died at the scene of the crash, Rubio said. 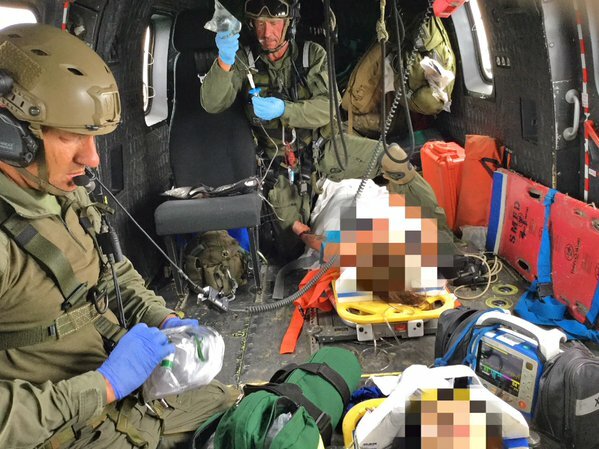 Two other patients were flown to a hospital by helicopter for treatment, sheriff’s officials said. Their conditions were not clear, and officials could not immediately confirm initial reports that the two injured patients had been riding in the car that collided with the motorcycle. The CHP issued a Sig Alert affecting both directions of Angeles Crest highway through the late afternoon, logs show. PASADENA >> Authorities Friday identified a 22-year-old Pasadena man who died in motorcycle crash on the 210 Freeway Thursday afternoon. Isaias Vargas Jr. died in the collision, which took place about 4:35 p.m. on the westbound 210 Freeway at Sierra Madre Villa Avenue, Los Angeles County Department of Coroner Assistant Chief of Operation Ed Winter said. Vargas was riding a 2014 Yamaha R6, between the carpool and fast lanes, and had just passed another car, prior to the crash, California Highway Patrol officials said in a written statement. “(Vargas) centered in the HOV lane and drove into the rear of a 2003 Dodge pickup that was slowing (and) stopping int he HOV lane due to traffic ahead,” according to the statement. He succumbed to his injuries at the scene, Winter said. A man, woman and three children from Lancaster riding inside the Dodge pickup truck suffered no injuries, according to CHP and Pasadena Fire Department officials.